NASA's Spirit took this image with its hazard-avoidance camera on sol 86, March 31, 2004, after the rover's rock abrasion tool had brushed for three minutes on each of six locations on the rock named "Mazatzal" to create a flower-shaped mosaic. The goal for this operation was to create a brushed area big enough for the miniature thermal emission spectrometer to capture within one of its pixels,which are 11 centimeters (4.3 inches) in diameter at the distance between the rock and the instrument. Because the rock abrasion tool creates individual brushed areas only about 5 centimeters (2 inches) in diameter, the team designed this six-location series of tool placements in order to brush 92 percent to 95 percent of the spectrometer's pixel size. This operation was only the second time the rock abrasion tool has created a brushing mosaic. 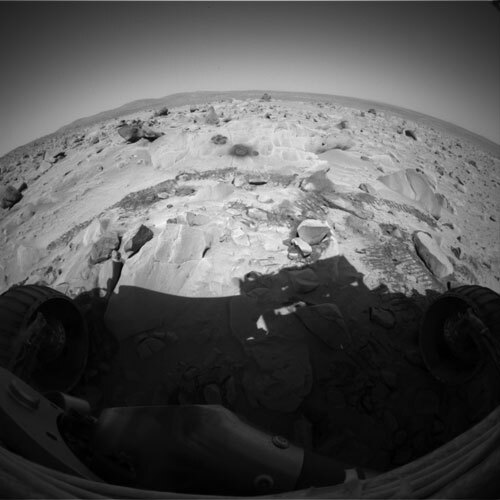 The first time was a three-spot brushing on the rock called “Humphrey.” The brush was originally designed to be used as an aide during full grinding operations, however it has been very effective in brushing the top layer off of dusty martian rocks to allow scientists a multi-depth look into the rocks on Mars.